Proper dental maintenance is essential to prevent periodontal disease and promote healthy teeth and gums in pets. Though a daily brushing is an excellent way to keep up on dental health, the most effective way to get rid of plaque build-up is offering your pet a raw meaty bone. The reason why plaque is so hard to remove from teeth is that the dental bacteria create a protective barrier, or biofilm, which cannot be permeated by water, toothpaste, or chemicals. Traditional brushing moves the plaque around the teeth, and while some is removed, much of the plaque and bacteria remain behind. Raw bones have naturally occurring enzymes which break down the biofilm. Then, when pets chew on the bone, the plaque is gently scraped off the teeth. For a dog that has never had a raw bone before, introduce it slowly. Let the dog have the bone in a confined space (maybe the kitchen, a towel on the floor, or even the bathtub) or outside of the house, for about 10-15 minutes for the first couple of feedings. 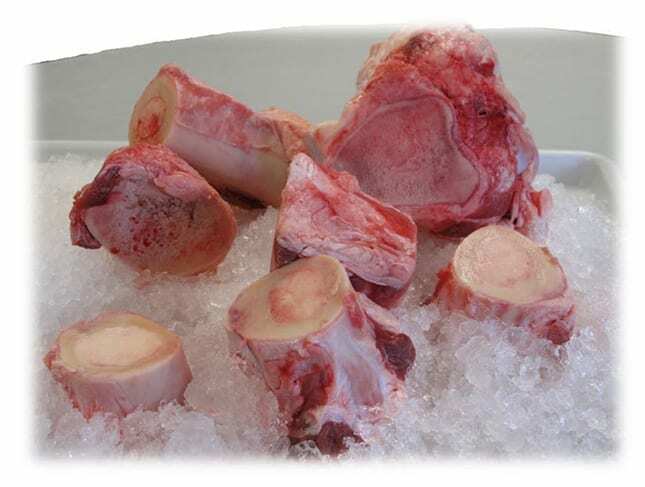 Since the marrow inside of a raw bone is very rich and is somewhat fatty, it can cause loose stools in dogs with sensitive stomachs if consumed in large amounts. The amount of marrow the dog consumes can be reduced by scooping the marrow out of the center of a femur bone and stored in the freezer to add to the bone again later. Once the dog is used to having raw bones in their allowed space, raw marrow bones can be fed around three times a week. Choose an appropriate size bone for your dog. Be sure to remove bones that start to crack or chip due to aggressive chewing. Small bones are not appropriate for aggressive chewers. Always supervise a dog when it is chewing on a raw bone. Dogs should be kept in a confined and monitored space and the bone should be removed if large chunks are bitten off or the dog appears in distress in any way. Feed raw bones in an area that can be easily cleaned. Remember that these are raw meat products and they should be handled with the same procedures as meat for human consumption. Always wash hands and surfaces with hot soapy water. Dogs should never be fed a cooked marrow bone. Cooking a bone completely changes the chemical structure of the bone and it becomes very hard and can splinter easily into very sharp, dangerous pieces. 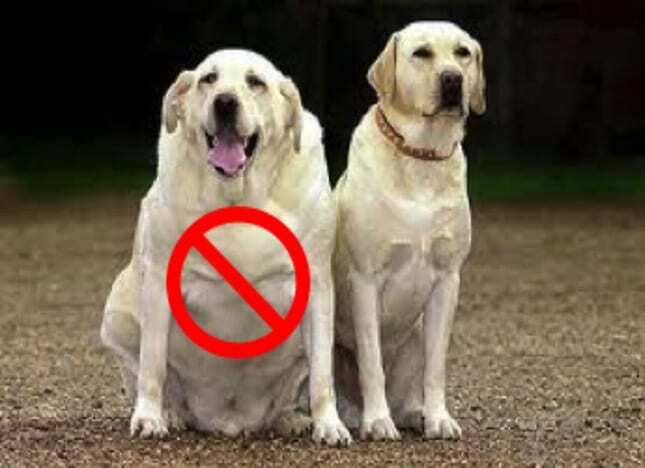 Separate dogs when you feed raw bones. Many dogs can get very territorial about their delicious bones! Broccoli – A plant in the cabbage family. It is high in vitamin C, calcium, soluble fiber, and also contains multiple nutrients, making broccoli a “super food” to support health and wellness. Superior fiber content — Sweet potatoes contain almost twice as much fiber as other types of potatoes. Contributing close to 7 grams of fiber per serving, they make an excellent starchy addition to any meal. The high fiber content gives them a “slow burning” quality, meaning their caloric energy is used more slowly and efficiently than a low-fiber carbohydrate. Vitamin B 6 – Sweet Potatoes contain a large amount of Vitamin B6. This vitamin is crucial in breaking down a substance called homocysteine, which contributes to hardening of the arteries and blood vessels. Vitamin B6 helps keep the walls of these important blood passageways flexible and healthy which allows blood to flow freely. Vitamin B6 promotes a happy, healthy heart! Beta-carotene or Vitamin A – is an important antioxidant. One medium sweet potato provides your body with the complete recommended daily allowance of vitamin A and then some. Vitamin A is useful in the prevention of several different types of cancer as it is one of the most potent antioxidants out there. It also is an excellent nutrient for eye health and has been linked to prevention of vision loss and macular degeneration. Manganese – is a little-discussed trace mineral that has some great health benefits. It is a pivotal component in the metabolism of carbohydrates which helps support healthy blood sugar levels. This can help stabilize the appetite for hours as opposed to the temporary satisfaction that comes with most other carbohydrates. Carrots – A source of important vitamins, minerals, and carotenoids to help support the immune system and digestive system. They may also help support proper skin and eye health. Vitamin C and beta-carotene content provides many heart health benefits of romaine lettuce, including preventing the oxidation of cholesterol. Folic Acid found in romaine lettuce helps keep blood vessels healthy and clear. Potassium helps lower high blood pressure, which can contribute to heart disease. Improves muscle strength . Fiber also contributes to the heart health benefits of romaine lettuce, by removing bile salts, which requires cholesterol, thereby lowering high cholesterol as well. Stimulates fat burning since the body has to work harder to digest fiber. Romaine is a low-calorie, zero-fat food that can stimulate weight loss by burning more calories than it contains. Apple – Rich in Vitamin C as well as a host of other unique antioxidant and botanical compounds such as flavenoids. Apples provide soluble and insoluble fiber, some Vitamin C, beta carotene, potassium and boron. Blueberries – A source of powerful antioxidants that may help support health and vitality. High in Fiber. Cranberries – High in vitamin C, and have antioxidant and antibacterial effects in the body. High in Fiber. When a poultry bone has been exposed to heat through the cooking process, many things change. First of all, the chemical structure of the bone is altered. Water, cartilage, and blood vessel structures are removed and the bone becomes dry and brittle. It is no longer flexible, and without the connective tissues and moisture intact, it will easy snap into small, sharp pieces. It is the dangerously sharp pieces that pose the highest threat to our pets. Not only can the sharp edges puncture the trachea, intestines, and bowels, but they are no longer digestible and will stay intact through the digestion process, increasing the risk of damage to the pet. It is very important to monitor our pets (especially those scavenging dogs!) to make sure they do not have access to cooked poultry bones. The Glucosamine and chondroitin found in raw poultry bones are in a “bio-available” form, which means that they are already in the most digestible and ready-to-use, natural form. For example, this differs from a dry glucosamine supplement because a pet would have to first re-hydrate the dry supplement and then try to pull something useful from what is available, which is often not the complete amount of what is fed. A natural bio-available form is absorbed by the intestines in the regular digestion process and nearly every bit of the glucosamine is usable. In fact, it is encouraged to replace the use of glucosamine and Chondroitin supplements with three weekly feedings of raw poultry bones in a size appropriate for your pet. Enzymes and amino acids not only aid in digestion and the formation of proteins in the pet’s body, they are also an excellent way to clean the pet’s teeth. Through the chewing process, the enzymes are actually more effective in breaking down tough layers of plaque than daily brushings! Maintaining proper calcium and phosphorous levels in your pet’s diet is essential. Again, the calcium and phosphorous found in raw poultry bones are in a bio-available form and can easy be used by your pet. Poultry bones offer a low-fat source of meat and nutrients that can be used to replace up to three of your pet’s regular meals per week. Choose poultry bones that are appropriate for the size of your pet and simply feed only the poultry bone for that meal. Always supervise your pet when feeding raw meaty bones. In addition to all of the nutritional benefits, raw poultry bones are fun for your pet! Adding variety into your pet’s diet allows you both a break from the monotony of feeding the same meal every day and allows for varied sources for nutrition. It is very natural for dogs in the wild to seek out and chew on the bones of their prey and they enjoy the process. Chicken and turkey necks are similar in makeup in that they have a nearly identical amino acid chain, but they do have a couple of nutritional differences. Turkey is higher is selenium, iron, and zinc, and is a slightly leaner meat. The Chicken Necks include more flesh on the bone and have the skin attached, which is a great source of those natural omega 3’s and 6’s. Some dogs can “gulp” the whole bone. This means that they will swallow the whole bone without chewing it. This is actually a very natural way for a dog to eat in the wild, since they do not have the ability to move their jaw from side to side to grind and chew their food. A raw bone is considerably easy for a dog to digest and so it shouldn’t cause any digestive issues, as long as your dog is in good health and the bone passes down their esophagus without problem. However, we always suggest that when you feed a raw poultry bone to a “gulper”, you hold half of the bone in your hand and let them chew off a small piece first. Always feed raw poultry bones in a supervised environment. The backyard is a great place to offer one to your pet, but you can also try the bathtub (for smaller pets) or on a sheet in the kitchen. Just remember that this is a raw poultry product and any surfaces or materials that have come in contact with the poultry should be cleaned and disinfected. Poultry bones can be given to dogs of all ages, but when feeding to a senior pet, or one who has compromised tooth health, be especially diligent in making sure they can handle the raw bone well. Poultry bones can be used as meal replacements for your pet for up to three meals a week. There is no exact formula for how much raw bone your dog should have instead of their regular meal, but you can estimate based on the size of your dog and the amount of food they usually receive.